Let’s face it: tea is a hot drink. (Although sometimes we think it’s better served cold.) In 1990, Americans drank about $2 billion dollars in tea. Today, we drink about $10 billion dollars of tea annually. Here in the south, we tend to add so much sugar to our “sweet tea,” that it’s almost better served on top of pancakes than in a glass. However, when it’s not over-sugared, tea is a great way to stay hydrated while drinking something tasty. Depending on the tea you choose, you can also get lots of vitamins and minerals, plus some potent medicinal benefits to boot. Want to grow tea or wild harvest your own tea? Even if you don’t have a garden, there’s a good chance that there are edible plants growing in your yard right now, and some of those plants likely have flowers and leaves that make a delicious, healthy tea. And if you don’t have a yard, but you have access to the great outdoors, you might still be able to *forage some delicious, medicinal tea. *Warning: Don’t ever eat any plant that you aren’t 100% positive you’ve correctly identified; there are plenty of plants that can kill you or make you very sick. Organic Tea – Whether you grow, forage, or buy your tea, be sure that you’re not consuming plants that have been sprayed with various pesticides and herbicides. Ain’t nobody got time for that. Plus, it just doesn’t make medical sense to expose yourself to those compounds or use them on the flora and fauna we share the planet with. Given how many hybrid hibiscus plants have been bred over the past century, we’re hesitant to say that ALL hibiscus flowers are edible. However, what we can say with certainty is that the variety Hibiscus sabdariffa is not only edible, it’s delicious! It also makes a beautiful landscape plant. We eat the leaves, which have a nice tart tangy flavor in their own right. However, the calyxes (the fruit/seed pod of the plant) are where the real magic is. They’re a gorgeous deep red color and much “meatier” than the flower pods of other hibiscus varieties we’ve grown. Homegrown and homemade Hibiscus sabdariffa tea. The calyxes turn the water a gorgeous bright pink/red color. Flavor: Tangy and tart, pairs well with Meyer Lemon juice. To make hibiscus tea, snap the calyxes off of the plant by hand or with clippers once they’ve matured (usually ~48 hours after the flower drops). Chop up 1-2 whole calyxes (fresh or dried) for an intense red, tangy tea. Sweeten with honey or stevia leaf. Also great made into jellies, candy, spice, and other goodies. 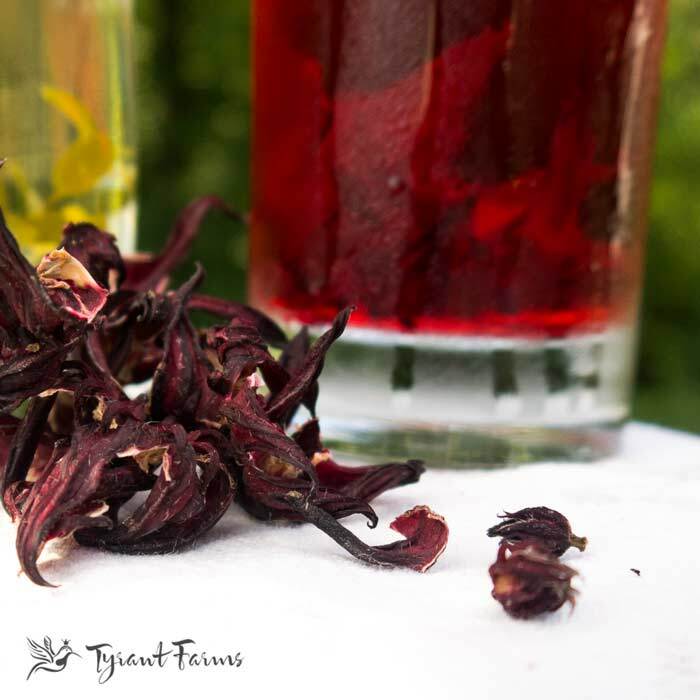 A USDA study showed consuming hibiscus tea lowered blood pressure in a group of prehypertensive and mildly hypertensive adults. Hypertension is a severe increase in blood pressure that can lead to a stroke. Researchers believe this is due to hibiscus’s angiotensin-converting enzyme inhibiting activity. Reduces total blood cholesterol, aka serum cholesterol. Stinging nettles growing in a secluded area of our backyard, close to the woods. There are native varieties of Stinging Nettle throughout North America, Europe, Asia, and Africa, so there’s a good chance you’ve seen this plant growing on the edges of fields and forests. Its leaf shape and growth habit is very similar to catnip. We also grow Stinging Nettle in our garden, but it can spread rapidly, especially if you let it seed out. As the name implies, Stinging Nettle (Urtica dioica) can pack quite a wallop if you touch it before it’s been cooked. It feels like a jellyfish sting. The plant’s trichomes (tiny stinging hairs on the leaves and stems) inject histamine and other chemicals into your skin. However, once cooked (boiled, steamed, steeped) its stinging abilities are neutralized and you can enjoy all the flavor, nutrition, and medicinal benefits the plant has to offer. It features a delightful floral-cucumber-spinach flavor, and is considered to be one of the most nutrient-dense vegetables in the world. 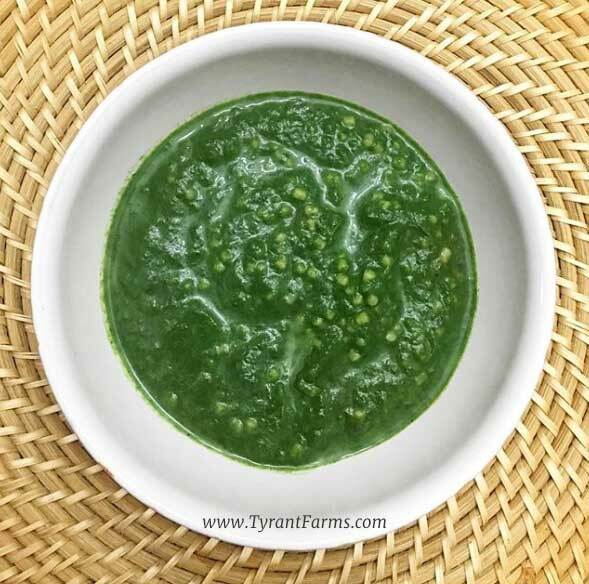 Stinging nettle also boasts one of the highest protein ratios of any veggie (up to 25% protein, dry weight), and is exceptionally high in Vitamins A and C, iron, potassium, manganese, and calcium. Flavor: Flowers, cucumbers, and spinach. The aroma of the tea is delightful: it reminds us of figs. 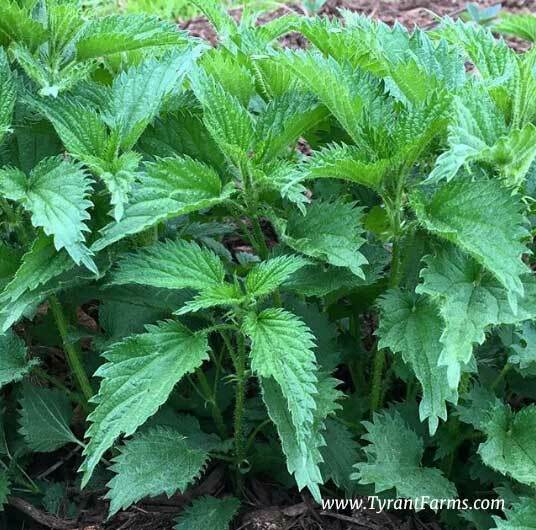 In our opinion, the young spring shoots and leaves of stinging nettle offer the best flavor when they’re about 6-8″ tall. Don’t eat them later in the season or they take on a gritty consistency. When harvesting, trim the shoots back to the first growth segment, so they’ll regrow. You’ll definitely want to wear gloves unless you’re a seasoned pro who knows how to handle the plant without getting stung by its trichomes. Pour boiling water over the freshly harvested or dried leaves; sweeten as desired. As mentioned, this is a wonderful food plant as well; two of our favorite spring treats are stinging nettle soup & stinging nettle pesto. Stinging nettle and Acini di Pepe soup. Delish! Pretty sure this is what gave the Incredible Hulk his superpowers. University of Maryland’s overview of Stinging Nettle indicates that the plant’s many uses in traditional/folk medicine are being confirmed by modern research findings. The plant has shown to be effective in treating Benign Prostatic Hyperplasia (BPH, aka enlarged prostate), eczema, arthritis, gout, anemia, and painful muscles & joints. Interestingly, it’s also shown to be effective at reducing general allergy symptoms. This is possibly due to the nettle’s ability to reduce our body’s histamine response to a particular allergen. We grow lots of different varieties of strawberries in our garden, ranging from the tiny yellow wonder strawberries to our native wild strawberry (Fragaria virginiana). We also grow domesticated ever-bearing varieties so we can eat fresh strawberries from spring through fall. We can’t understate how much we love strawberry fruit, so when we found out the leaves made a great tea, we considered starting a cult of strawberry plant worshippers to ensure the plant received its due reverence. 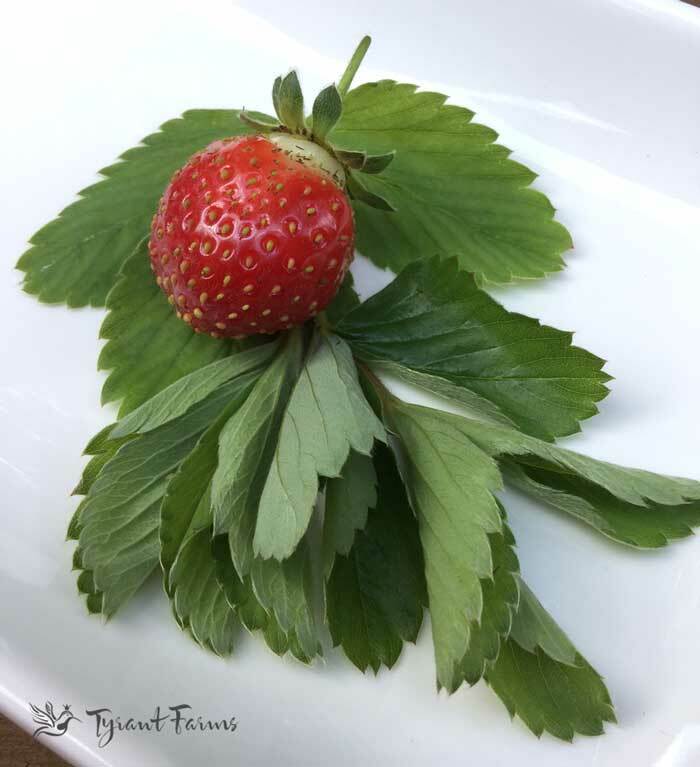 Flavor: Surprisingly fruity and delicious, but we’ve only used fresh Fragaria virginiana leaves; leaves from other strawberry varieties may offer different flavor notes. Use 1 heaping teaspoon of dried leaves or 3-4 chopped fresh leaves per cup of tea. Put leaves in tea ball or simply strain out when pouring into cup. Sweeten with honey or stevia leaf. Strawberry berries and leaves both contain a wide range of vitamins, minerals and beneficial compounds. Apparently, strawberry leaves—especially wild strawberry varieties—have exceptionally high antioxidant levels. Remember how we said we felt about strawberries? Ditto for raspberries. We grow a few different varieties of black, yellow, and red raspberries, and love them all in their own right. Our black raspberries usually come in first, followed by the reds, then our goldens. We also have ever-bearing gold and red varieties that will produce throughout the summer into the fall, so we’re never without raspberries when the weather is warm—which would be positively inhumane. 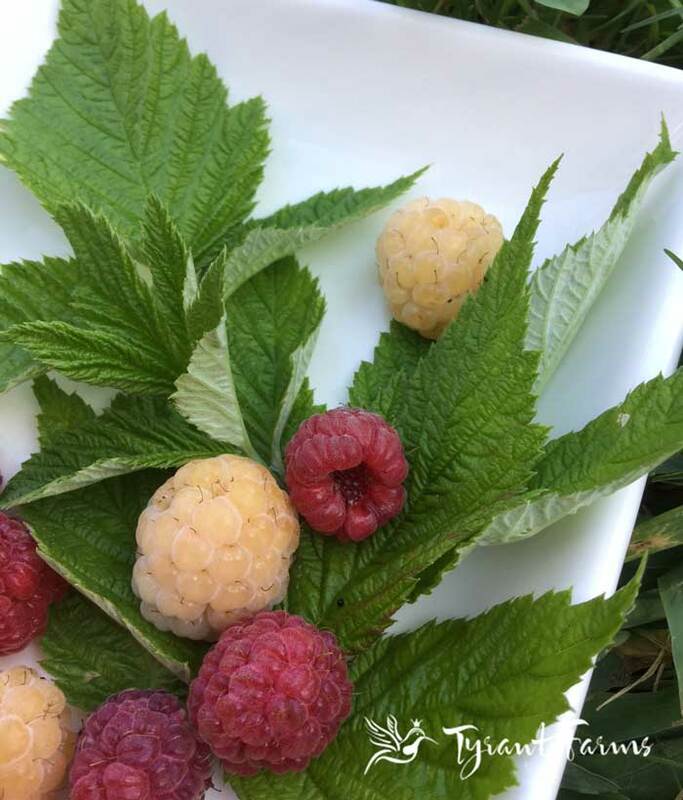 The reds offer a bit more tang than our gold or black raspberries, however we can’t tell any difference in the flavor of the leaves of our various raspberry plants when they’re made into tea. Ever-bearing red and golden raspberries – leaves and fruit. Flavor: Tea made using the fresh leaves taste surprisingly similar to the actual berry: sublime hints of tang and fruit. When you use dried leaves, the tea takes on a flavor more reminiscent of black tea. We trim some of the newer leaf growth from our raspberry plants as they emerge, being sure not to over-harvest the leaves in such a way as to inhibit fruit growth. Also, since cane berries tend to be very vigorous and spread via underground runners, we’ll save the leaves from any canes we trim out of beds. We dry the leaves indoors on drying racks. This easily provides a few large zip lock bags full of dried raspberry leaves for us to enjoy as tea throughout the fall and winter, when the fresh leaves are unavailable. For a strong cup of raspberry leaf tea, steep a tablespoon of dried leaves in near boiling water for about 5 minutes. The berry fragrance and flavor is amazing! Sweeten with honey or stevia leaf. Raspberry leaves are high in calcium, iron, magnesium, phosphorus, potassium, phosphorus, not to mention Vitamins A, B complex, C, and E. Does raspberry tea leaf tea work miracles for pregnant women? We’ll let you be the judge, but we’d like to see more well-conducted, large scale human studies before passing judgment. Trivia time! What’s the only plant native to North America that contains caffeine? Answer: Yaupon Holly. And there’s a good chance you or one of your neighbors have it growing in your yard, since it’s such a commonly used evergreen landscape plant. It can reach 30′ in height, but is typically kept trimmed to a small bush, often in rows or hedges. It’s also interesting to note that Yaupons were of great cultural importance to various Native American groups living in the southeastern US, the plant’s native habitat. They used it both in ceremony and as a welcoming drink when hosting guests. European settlers referred to the ceremonial Yaupon concoctions the Native Americans made as the “black drink,” and thought that it induced vomiting. This mythology earned the plant its scientific name “vomitoria,” from William Aiton, who grew it in his garden in Kew, England, but never actually drank the tea or even travelled to the New World. Despite its name and mythology, the leaves of Yaupon Holy are quite safe; it’s the berries that can lead to GI discomfort. In fact, up until the early 1800s, teas made from Yaupon Holy twigs and leaves were quite popular with European settlers and African Americans, not just the Native American populations. The displacement and/or genocide of the Native Americans combined with effective marketing by imported tea and coffee suppliers likely hastened Yaupon Holly’s decline in popularity as a beverage. Yaupon Holly: our new favorite caffeinated tea that also happens to be growing 20 feet from our front door! Trim the young growth tips off the plant for best flavor (older leaves and twigs are fine too, but may produce a stronger flavor). 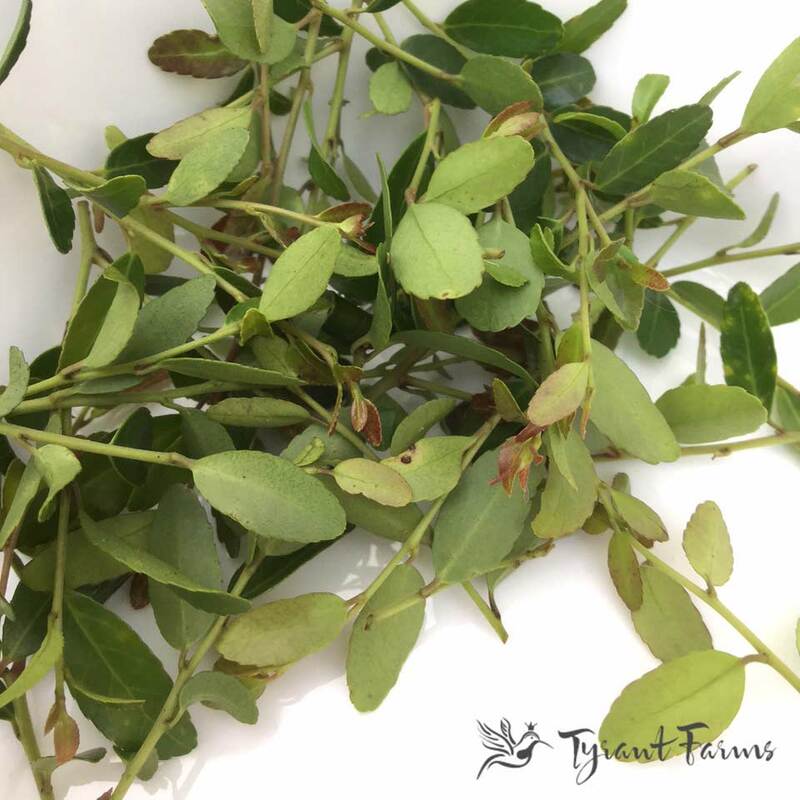 Both the stems and the leaves can be used fresh or dried in tea. Do NOT use the berries, as these can make you sick (see above). Use 1-2 teaspoons of chopped fresh or dried leaves and stems per cup of tea. Steep in near-boiling water for 5 minutes. The tea is light greenish-brown in color. Again, this drink does contain caffeine, so be prepared for a nice lift! Five independent research studies confirm that Yaupon Holy tea made from the leaves and small twigs of the plants are rich in both caffeine and antioxidants. Research on possible medicinal qualities of Yaupon Holy are virtually nonexistent, however, there is some research being conducted on the broader Ilex family that shows some amazing possibilities, ranging from possible anti-diabetic, anti-cancer, anti-inflammatory, and cardiovascular benefits. Remember how we said we felt about strawberries and raspberries? Yep, same with blueberries. Without blueberries, would there really be any reason to go on living? It’s debatable. We were excited when we found out that blueberry leaves also made an antioxidant rich tea. You can technically harvest the green blueberry leaves for tea. However, the best time of year to harvest blueberry tea leaves for maximum flavor and health benefits is in the fall once their colors start to turn crimson due to higher concentrations of anthocyanin flavonoids, beneficial antioxidant compounds in the leaves. Blueberry leaves picked at the perfect point of “ripeness” for tea – when they’re bright red after a frost. Flavor: Does not taste like blueberries; very subtle flavor with notes of grass, flowers, and bit of bitter. 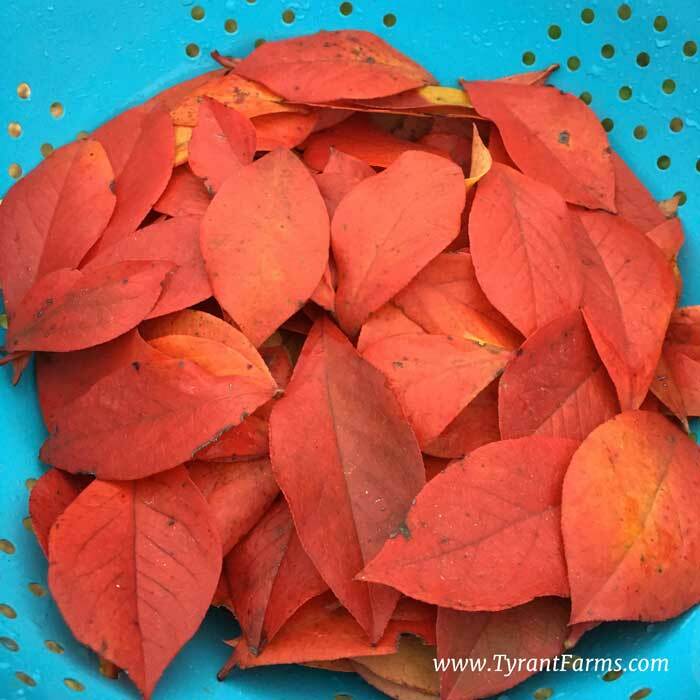 Harvest leaves in fall when they’ve turned red due to cooling weather. Use 1-2 teaspoon chopped fresh or dried blueberry leaves per cup of tea. Steep in near-boiling water for about 5 minutes before serving. Sweeten with honey or stevia leaf. Just like the plant’s berries, blueberry leaves are also exceptionally high in polyphenols, a type of antioxidant. Research indicates that the compounds found in blueberry leaves could help with various neurodegenerative diseases, Type-2 diabetes, and also offer possible anti-inflammatory and anti-allergenic properties. We hope this article helps you make more tea time! Final tip: always make sure that your pinky finger is fully extended when sipping tea. Doing so gives you the air of sophistication, especially if you’re wearing a monocle.